If you have to do a lot of traveling for business, then you probably appreciate all the opportunities to connect to public WiFi hotspots when you’re on the go. While the number of hotspots is growing in coffee shops, hotels, restaurants, airports, and even public areas like parks and buses, they also represent ripe opportunities for hackers to steal the sensitive information both on your mobile device and the websites you are accessing. As a business traveler, you not only have to worry about your personal information, but you may also have sensitive business data, such as customer profiles as well as connection to a company intranet, that you need to protect. While it is best to stay away from accessing your credit card information, bank account information, or performing a financial transaction of any sort on unencrypted free wireless service, there still are some simple steps you can take to help make sure your data is as safe and secure as possible when using open public WiFi. Install a reliable firewall on your device and make sure that the firewall is enabled before connecting to an open WiFi hotspot. If you use a web-based email service, such as Gmail, Yahoo, or Outlook make sure your login, email composition, and email browsing all use a secure https connection. Get a virtual private network (VPN), which is a service that encrypts all of your internet traffic making it undetectable to hackers. Opt to use your cellular or mobile network connection instead for sensitive transactions. There are several ways that you can do this: you can use the mobile broadband connection on your mobile device; if you are using a laptop, you can tether your phone to your computer, and the phone can act as a modem; purchase a dedicated mobile modem; or get a mobile hotspot. 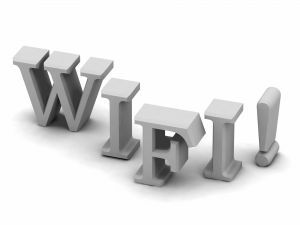 Again, in situations where you must use open WiFi without any protections then make it a point to refrain from conducting financial activities or using any platform where you need to login and keep those prying eyes away.